Around two years ago I decided that the title of my new album was going to be Climb That Tree. I was getting more and more theatre bookings and decided that when I toured the album I wanted the show to be a touch more theatrical. However I was also very keen to avoid the music getting lost amongst props, stage sets, lighting cues and dodgy scripted dialogue. I firmly believe in the mantra of stick to what you know. I’m not an actor, and at this point had very little knowledge of children’s theatre. So, how could I make a family gig more visually appealing and theatrical whilst ensuring that music and song still remained the focus? The solution I came up with was a set piece which could add a framework and structure to the songs being performed. I decided that the best option would be a tree. After all, the album was called Climb That Tree and a tree is also something that’s familiar and friendly to almost all children. I decided that this tree would absorb objects related to the songs I would play and, when the time came to play the song, a flower on the tree would open to reveal the object. The next step was to find someone to make this tree for me. After speaking to lots of friends and colleagues, someone recommended that I get in touch with Vortex Creates, a theatre design company based in Coventry. We talked a lot about what the tree might look like, and I sent them over a Pinterest board that I had put together when I first came up with the idea of the tree. I also sent them the album artwork created by the lovely Pippa Curnick, as I was really keen that the tree look similar to the tree featured on the album cover. We all agreed that the tree would need to be taller than me (I’m 6″5) so as to look impressive on stage. We also decided that the flowers show be really bright and colourful to fit the feel of the show and music. They thought that the best way to have the flowers open would be to use electromagnets triggered by a series of foot switches which I would control. Nicola and Marianne went away and started work, and after a week or so I received a concept drawing from them. It looked amazing and I very quickly sent them an email to say that I was really happy for them to start work on building the tree. Around three weeks later, I got another saying that the tree was ready to collect. To say I was excited would be something of an understatement. It was a very special moment when I arrived at their workshop and finally saw this thing that I’d been holding in my head for the past two years. It was HUGE and it was also beautiful, just the right balance of magic, welcome and intrigue. Since that day my beautiful, magical, musical tree has appeared all over the country in countless theatres and art centres. As a concept it’s given my show a real structure and I will never get tired of hearing children and families gasp with delight every time a flower magically opens to reveal a song within. 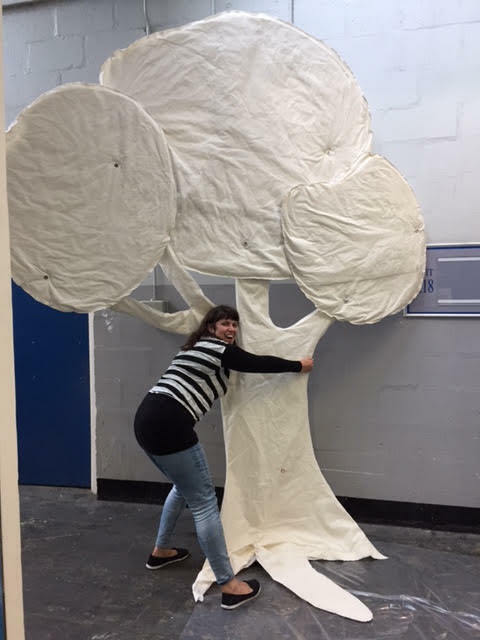 Climb That Tree was made possible thanks to generous funding from Arts Council England.